The Bracco Italiano is very much a people dog as they bond closely with its family. They are highly trainable, but the Bracco Italiano can be stubborn at times. Harsh reprimands to undesirable actions do not work with this breed. These hunting dogs love to hunt and have a exceptional nose. 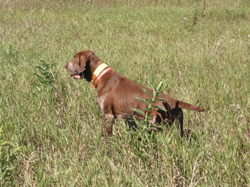 With a love of water and a strong desire for retrieving, the Bracco Italiano is an ideal versatile hunting dog. It is a large gun dog that should have a square stature, with the coat being short, dense and glossy. The variation in color for the Bracco Italiano is white with orange, chestnut, or amber colored patches. 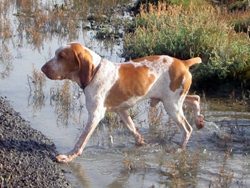 Today, the Bracco Italiano is still one of the most popular breed of hunting dogs in Italy. Additional breed information for the Bracco Italiano can be found at the American Kennel Club website.